Sadhguru Jaggi Vasudev of Isha Foundation says that whatever you consume should not be too far away from the body temperature. According to him, serious spiritual aspirants can drink water which is within four degrees centigrade of their body’s normal temperature, i.e. between 32 and 40 degrees centigrade. And a student must drink within eight degrees centigrade of the body’s temperature, i.e. between 28 and 44 degrees Celsius. And a householder who is not interested in any transformation or learning can drink water that is within twelve degrees centigrade of the body temperature. Anything beyond this temperature is not conducive to anyone as per Sadhguru. According to the American College of Sports Medicine, water and other drinks should be between 10 and 23 degrees centigrade for optimal hydration. In any case, we should trust our instincts and listen to our body. Our body can tell us what it actually wants. Whatever temperature of water feels more suitable to you, drink it. It's far more important to stay hydrated. Nonetheless be aware that very hot beverages, drinks hotter than 65 degrees Celsius can scald your esophagus (causes thermal injury to the esophageal mucosa), thus increasing your risk for esophageal cancer. While most people prefer chilled water from the refrigerator, I never liked the feeling of extremely cold water / ice-cold fridge water going all the way down my throat. I've always preferred my beverages to be cool but not ice-cold. And water in an earthen pot or matka is just of the right temperature for me in hot summers. During summers, it's my regular practice to take out my lovely mud pot and store drinking water in it. And sipping this naturally cooled water is simply heaven for me. It's soothing to my throat and cool enough to induce that refreshed, pleasurable feeling. How does water in a mud pot stay cool? Water in a mud pot evaporates through the tiny pores by capillary action. This expends some energy by taking the heat from the water inside, thus making it cooler than the outside temperature. Hence water in an earthen pot stays cool and hence most preferable drinking water storage container in summers. Storing potable water in a clay pot is a far healthier alternative compared to water stored in plastic bottles or jars. Drinking water from low-grade plastic bottles and jars can prove to be a health hazard as the chemical BPA in it can leach into water, causing various health problems. Now water stored in steel vessels or glass bottles and jars is not bad per se, but they don't have any health benefits also. Copper vessels are an exception though, and have immense health benefits but that calls for another post. Now to the clay pots! As we all know, water stored in the mud pot is naturally cool unlike that of refrigerated water and additionally has healing elements of the earth. Clay pot water is also gentle on our throats and teeth because the temperature of the water isn't extremely low. Those suffering from sore throats, coughs and colds, asthma and sensitive teeth can safely drink water from an earthen pot without any issue. Clay is also alkaline in nature and cooking food in clay vessels apparently reduces the acidity of the dish and neutralizes the pH balance. Something that is naturally very acidic, like a tomato sauce, will take on some natural sweetness when cooked in a clay pot, as per this food blog. Drinking water from an earthen pot is thus best for those suffering from acidity, hyperacidity, stomach ulcers etc. Clay pot water has an earthy, natural taste and furthermore can improve your metabolism too. So there is no reason why you should not buy one! Earthen pots are eco-friendly also. Even the manufacturing process of these pots result in no harmful byproducts. No electricity is required in the cooling process. Naturally cooled and chilled potable water with an earthy flavor is what you get from this humble pot without much hassles and energy expenditure. The disposal of the pots also poses no problem as they are made of clay / earth. 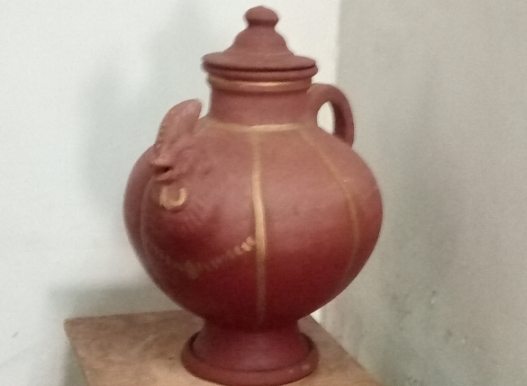 How do I store water in the earthen pot? I usually store RO purified water from my Kent water purifier in my lovely clay pot. You can also store boiled and cooled water in the pot. It takes some time for the water to cool once stored in the earthen pot; a few hours are needed actually. So if you drink the water as soon as you put it in the pot, you may not find it so cool. Always keep your pot covered to avoid dust and other contaminants falling in it. The first time you pour water in your mud pot, especially when it's new, it will have a strong clay flavor which eventually disappears as you keep refilling it and using it everyday. It's essential to clean the pot once in 3 days. Gently scrub and wash it and once it dries (it really dries up quickly) pour fresh water into it. Hydration in summer is very important. In the hot, humid days of summer it's very common to get dehydrated. So you should remind yourself to drink water every now and then to compensate for this additional need of H2O. Drink water before you actually feel dehydrated. Dizziness, nausea, headache and mood changes can all occur due to drinking less amount for water. Drink at least 10 glasses of water per day when it is warm and humid and more if you exercise or workout .Read the post Combat dehydration by drinking water sufficiently. The unique, earthy flavour of water from a clay pot will compel you to drink more water. So go get an earthen pot now! Stop drinking chilled refrigerated water and switch to clay pot water. You'll soon notice the health benefits and wonderful after-effects. Once you get used to this water, you would never want to drink refrigerated water again. You should be eating lots of fruits and vegetables and in summer months, especially, you should load up on fruits with high water content such as watermelon. Watermelons are plentiful in summers and are easily available. Even mangoes, grapefruits and berries are all rich in water. Along with intake of water, having these fruits in summer most certainly helps you stay hydrated. Most of these fruits also have some essential electrolytes, which are crucial during summer. Speaking of electrolytes, how can one forget tender coconut water? It's the utmost healthiest and hydrating drink for summer months. So happy summers and happy hydration! Drinking water from natural filtration is better than chemically treated water as human body would need few bacteria to develop immunity within the body. Bottled water can last only for a couple of days and then starts emitting bad odor. the plastics used for bottles contain chemicals having estrogenic activity. Good article.Answered many of my doubts.